Black Friday was bright for a couple of holiday specials. 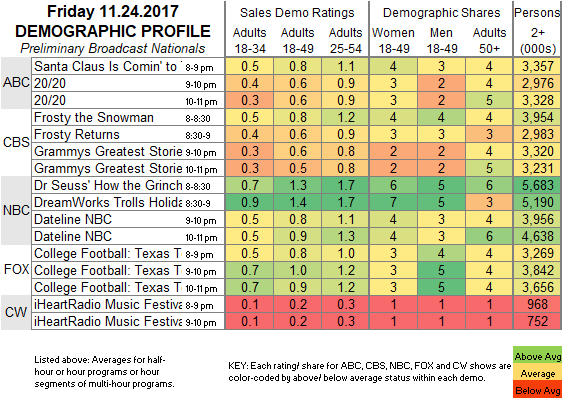 NBC: The original HOW THE GRINCH STOLE CHRISTMAS was up 0.1 from last year’s Black Friday airing to 1.3, and the TROLL HOLIDAY special hit 1.4. They were followed by 2 hours of DATELINE at 0.9, steady with last week. ABC: SANTA CLAUS IS COMING TO TOWN held last year’s 0.8. 20/20 followed at 0.6, down 0.1 from last week. CBS: FROSTY THE SNOWMAN and FROSTY RETURNS were at 0.8/0.6, down from last year’s 0.9/0.8. A GRAMMYS GREATEST STORIES special was at 0.6. FOX: The Texas Tech vs. Texas COLLEGE FOOTBALL game had a preliminary 0.9. CW: The second night of the IHEARTRADIO MUSIC FESTIVAL special was at 0.2. COLLEGE FOOTBALL continues to dominate Saturday primetime tonight. On Sunday, FOX has the MISS UNIVERSE pageant. CABLE RATINGS: Come back Tuesday afternoon for detailed demographic ratings for top cable programs from this day, later than normal due to the Thanksgiving holiday weekend.